Some days seem really thin, useless. I drift around in a daze of public transportation and work for hire. I eat my stupid little breakfast, wade through the first swamp of hours, eat my stupid little sandwich, wade through the second swamp of hours, somewhere in there read about the Red Sox and take a couple dumps, then watch television, maybe pick up a player on waivers for one of my imaginary teams, at some point try and fail to write a true sentence, go to bed feeling tired and paradoxically bloated and empty, wishing I was religious so I could swipe the whole vague heavy ache away with prayer, but instead I just fall unconscious and wake up the next day still far from the Wonder of Boog. What is the Wonder of Boog? I’m not entirely sure, since I just sort of made it up. I mean, in a way I just sort of made it up, but in another way it’s been with me as long as this card’s been with me, 32 years and counting. In fact it’s been with me even longer, but the arrival of the card in my young life concentrated the nameless concept into the image seen here. 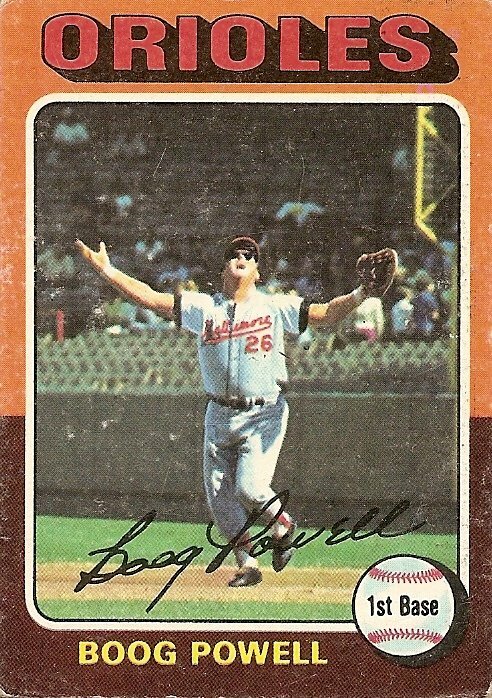 As with the Rudy Meoli card from the same year, I did not initially understand the literal meaning of this image, and my initial misunderstanding has lasted far beyond the point when I realized Boog Powell was calling for a fly ball, nothing more. The misunderstood view still defines this card and defines, as much as anything can, the concept of the Wonder of Boog: I thought when I first looked at the card that Boog Powell—Boog Powell!—was throwing his gargantuan arms wide to the sky in awe and jubilation. You are currently browsing the archives for the Boog Powell category.